The 20 safest airlines are selected from a pool of 409 carriers. The publication's editors selected the 20 safest carriers from a pool of 409 airlines. AirlineRatings did not name a "safest" airline. Just a list of the top 20. Air travel is one of the safest forms of transportation around. And things are only getting better. That said, some airlines are still better at it than others. That is why AirlineRatings.comreleases an annual list of the 20 safest carriers in the world. "With travel today taking passengers to every corner of the globe, with hundreds of airlines to choose from and a wide variety of standards from one airline to another, it is essential that passengers get the right information about the safety ratings as well as product," AirlineRatings.com Editor-in-Chief Geoffrey Thomas said in a statement. The publication's safety-rating system was developed with the help of the United Nations' International Civil Aviation Organization. The 20 safest airlines are selected from a pool of 409 carriers. To compile its list, the website's team of editors evaluated each airline based on its standing with international regulators, its fatality record over the past 10 years, the age of its fleet of planes, its result from an International Air Transport Association safety audit, and whether its country of origin conformed with the International Civil Aviation Organization's eight-point safety parameter. All of the airlines on this list passed those tests with flying colors. This year, the editors at AirlineRatings.com declined to select a single winner. 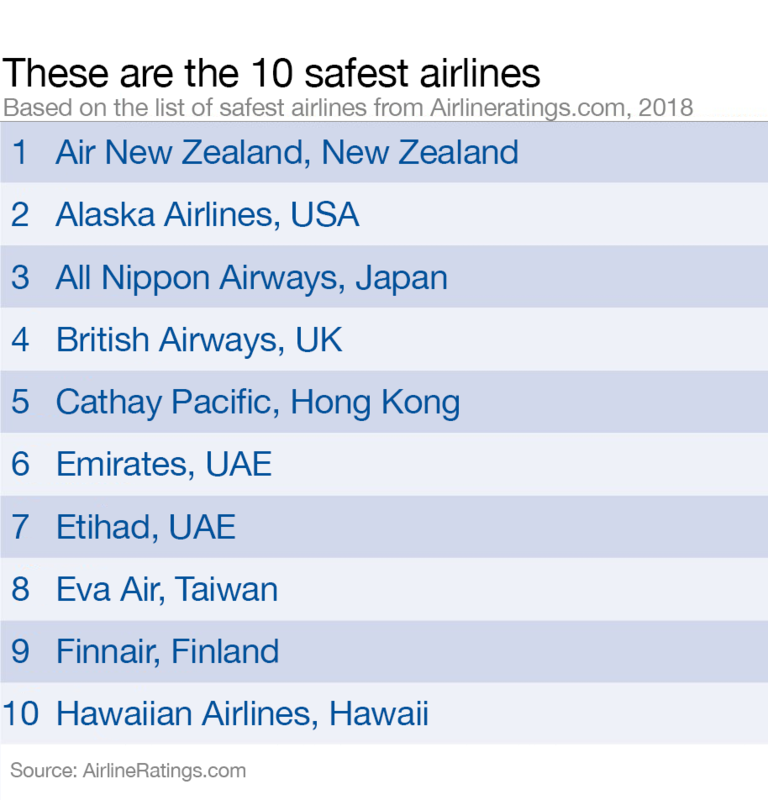 Instead, they simply named the 20 safest airlines in the world in alphabetical order. Here's a look at which airlines made the list. 1. Air New Zealand has made a fine recovery after a period of financial turmoil in the early 2000s. This renaissance culminated with AirlineRatings.com recently naming it the best airline in the world for the third year in a row. Air New Zealand has not suffered any significant incidents in the past couple of decades. 2. It may be called Alaska Airlines, but it's actually based in Seattle. The carrier is a mainstay on the West Coast of the US. Alaska recently made a major splash in 2016 with the $2.6 billion acquisition of Virgin America. The Virgin America brand will cease to exist in April. The airline has not suffered a fatal crash since 2000. 3. Founded in 1954, All Nippon Airways is well regarded for its consistent and high-quality service. Last year, Skytrax ranked All Nippon sixth on its list of the world's best airlines. ANA has not had a fatal crash in more than 45 years. 4. British Airways formed in 1974 following the merger of British Overseas Airways Corporation and British European Airways. The airline has not experienced a fatal accident in three decades. 5. AirlineRatings.com recently named Cathay Pacific one of the 10 best airlines in the world. And as outstanding as its service may be, the airline is just as competent in terms of safety. Cathay Pacific has not suffered a fatal accident, which do not include terrorist attacks, since the 1960s. 6. Over the past 20 years, Emirates has emerged as a major power in the world of commercial air travel. The airline, known for its elite service, also has an impressive safety record. The airline has suffered only one hull-loss incident in its 31-year history. 7. Like its neighbor, the Abu Dhabi-based Etihad has maintained an unblemished safety record. It's truly remarkable how quickly the decade-old airline has grown in scale and reputation. 8. In the US, Taiwan's Eva Air is best known for its Hello Kitty-themed planes. EVA, however, has long been considered one of the best carriers in Asia. The airline has not suffered any major accidents since its founding in 1988. 9. Finnair, Finland's national airline, doesn't get as much attention in the media as some of its Scandinavian counterparts. But don't discount the Helsinki-based carrier. It has one of the best safety records in the business and hasn't suffered any major accidents since the 1960s. 10. Founded in 1929, the Honolulu-based Hawaiian Airlines has been consistently regarded as one of the best in the US. Hawaiian, which now boasts a fleet of more than 50 wide- and narrow-body airliners, has never experienced a fatal accident. What will travel look like in 2030? Which are the most tourist-friendly countries? 11. Established in 1951, Japan Airlines has been Japan's national air carrier for more than 60 years. It has not had a fatal crash in more than 30 years. 12. Founded in 1919, KLM is one of the oldest and most trusted names in the airline industry. Though KLM and Air France merged in 2004, the two airlines operate under separate brands. KLM has not had a fatality in almost 40 years. 14. Qantas is the Volvo of the airline industry — a company whose reputation and mystique is built upon its clean safety record. This is for good reason. The 96-year-old airline has not had a fatal crash since 1951. 15. Royal Jordanian may not be one of the Middle East's more talked about airlines, but it's certainly one of its safest. The airline hasn't had a major accident in more than three decades. 17. Singapore Airlines is universally lauded for its high-quality service and efficient operations. Skytrax named Singapore the second-best airline in the world. The Changi Airport-based carrier has been accident-free since 2000. 19. The Crawley, England-based Virgin Atlantic is billionaire Richard Branson's original aviation venture. Since 2012, 49% of the carrier has been under the control of the Atlanta-based Delta Air Lines. Virgin Atlantic has not suffered any fatal crashes in its history. 20. Virgin Australia, the Australian offshoot of Richard Branson's aviation empire, was founded in 1999 as a low-cost carrier called Virgin Blue. In 2011, the company switched to a traditional, full-service business model and was rebranded as Virgin Australia. The airline has no fatal crashes in its history.